Meet the super talented, motivated, and go-getter local artist, Elana Schwartzman. Although she is currently running her own printmaking studio, Elana actually has a background in marketing and communication. She has worked with nonprofit, for-profit, and electoral organizations and campaigns throughout the Twin Cities, with a particular emphasis on social media strategies and online development. 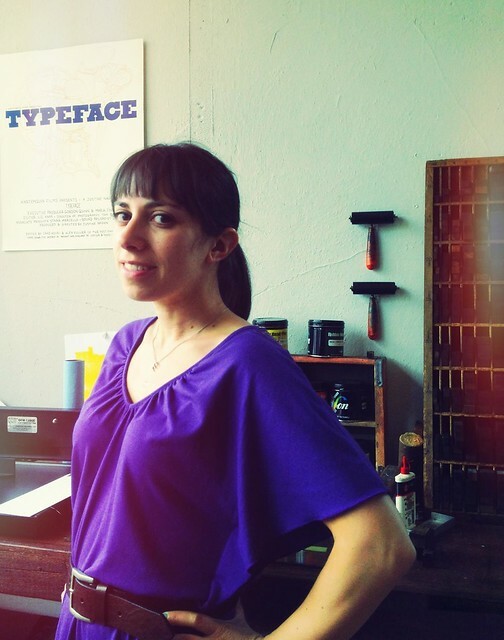 About four years ago, she began printmaking, and since has started Fontlove, a letterpress studio working with nonprofit organizations and collaborating with other creatives! Wow! Elana is the perfect person to interview for the You Can Do It, Put Your Back Into It exhibition, a show all about flexing your creative muscles, getting out there, and getting to work. Can you tell me a little about yourself, your background, and interests? I am a Minneapolitan by way of the Chicago area, and I've lived here for about 13 years. My background is actually in non-profit work – while doing communications for a small organization, where I had to do everything from PR and social media to web content management and publications, I discovered that I loved graphic design. Around that same time I took a class in letterpress printing at the Minnesota Center for Book Arts – and fell stupid in love with it. Typography has always been of intense interest to me, but I also love the machinery involved in letterpress printing, and the smells and textures of things like ink and paper. I stayed in communications for several years before jumping into the deep-end and freelancing. I am self-taught and constantly worried that someone will come and strip me of my (metaphorical) graphic designer / printmaker badge. When not worrying about that (or cleaning ink off my hands) I love to walk the lakes, drink local beer, and make snarky commentary. I have been a collector for as long as I can remember, and I obsessively look for vintage objects and ephemera with the patina of everyday life. How did you get started in printmaking? Like all kids, I was creative when I was young and unencumbered by the inhibitions of adulthood. I was a mostly solitary kid, but I took a lot of art classes. I still remember taking a printmaking class when I was 9 or 10, and how much I loved it. One of the prints I made then still hangs in my mom's bathroom. Then, I grew out of it. I felt like I didn't have natural talent (I can't draw a likeness to save my life) and I was passionate about social justice and working in a field where I could make an impact. But bit by bit, I found that I loved the parts of my job that let me be creative. The 2008 Obama campaign had a huge impact on me – I saw the power of typography, of Hoefler & Frere-Jones' Gotham typeface, to bring a movement together and inspire people. The Shepard Fairey poster that reached down and influenced many people, not just those that pay attention to graphic design or street art. I started playing around with basic relief printing in my apartment, carving linoleum, and then took the class at MCBA. I got truly addicted, buying my first press before that class even ended and haven't looked back since. 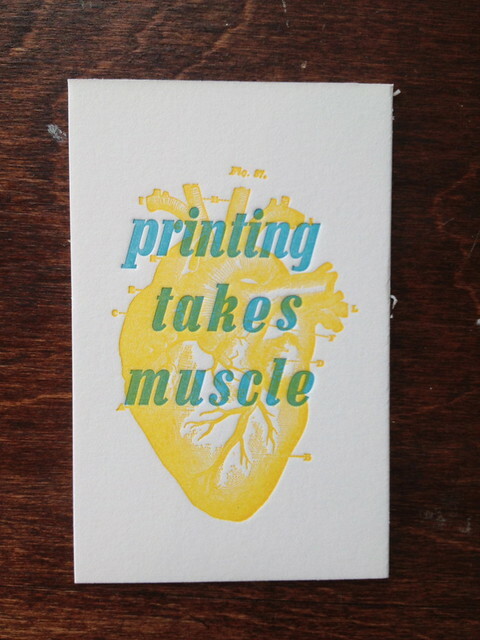 I now have four vintage presses and operate a full-time letterpress and graphic design business. How did Fontlove begin? What was it inspired by? It began in stages. At first it was just me, in my basement studio, teaching myself to print and hating everything I made while falling more and more in love with the process. It was a confusing time. Then came the "notebook stage" – I carried Field Notes notebooks around with me everywhere and jotted ideas for products I would love to make, or make up pretend schedules for what my day would look like if I quit my job to pursue this full time. There were a lot of pro/con lists, too. Then there was the "oh crap, I have all this stuff, now I should put it to use" phase. Like I said, I'm a collector, and I pretty quickly had spent a lot of money on equipment, so I got to work getting good enough to be a printer for hire. I would say that it was inspired by the obsessive need to print/make stuff. Most of your work is text based. What are some of your favorite phrases, words, subjects to work with? I usually start with the typeface. Because I work with real moveable type – both metal and wood – it's not just like the endless options on your font menu on a computer. You really get to know a typeface, and understand in a physical way what it means for a font to be "condensed" or "italic" and how those are best applied to a given situation. I don't necessarily have favorite words or phrases, but I do have favorite letters. The uppercase R in the typeface Antique Extended is one of my all-time favorites, and it's one of the reasons I used it in my work for You Can Do It Put Your Back Into It. My grandfather used to say that one should "plan your work and work your plan", which I love on its own as a motivational phrase – but it also uses a lot of R's. What is your favorite part about traditional printing? What other materials and mediums inspire you? Letterpress printing is a centuries-old process. I am most interested in working with the original tools of the trade – wood and metal type, old halftone cuts, borders and ornaments. That means that my work is often defined by my constraints. I can't just make the text bigger or smaller. I can't use a font I don't have. Kerning involves physically carving up the type, sawing through wood or lead. I find these constraints inspiring, and it has defined my personal style. I love the imperfections of the type and the variations in inking and texture – but it's also what I have to work with. Currently, it's a bit of organized chaos. 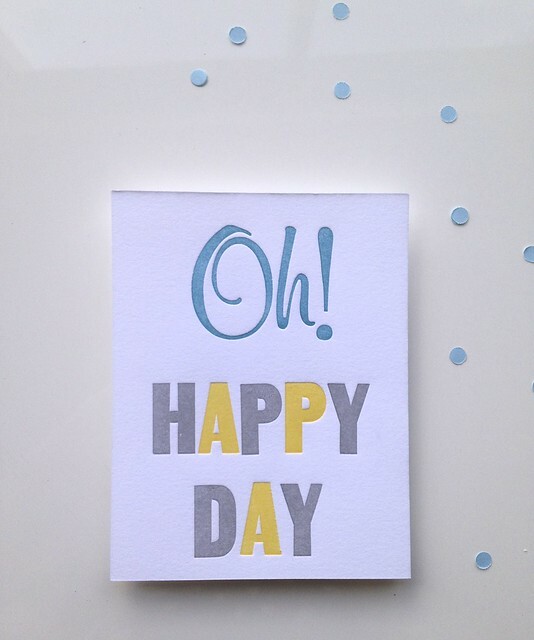 Day to day I could be working for a client on digital graphic design, printing business cards or invitations for hire, or printing personal projects for my Etsy shop – and sometimes all three. And the reality of working for yourself is that a lot of my time I'm also replying to emails, sending proposals, and data-entering receipts. I work in the front half of a storefront studio with huge windows and lots of light. I'm a very neat person at home, but my studio tends to be an explosion of type, paper scraps, failed experiments, and bits and pieces of inspiration. I love to try new techniques, like pressure printing or experimenting with overprints – but those things rarely make their way into my work for show or sale. What is your biggest motivation when you are stuck on a project? I usually get stuck when my confidence takes a dip. So if something isn't going right – the inking is inconsistent, the impression is wonky, the registration is tough, or I'm just not liking the way it's turning out – I take a break and make something else that I know will be successful and look beautiful. I do tend to get easily demoralized, so my biggest motivation is just to remember that there will be clunkers and there will be stars, and a lot in between, and not to sweat it too hard. Unless it's a paying client, when my motivation is making sure they get the highest quality printed goods I can provide. 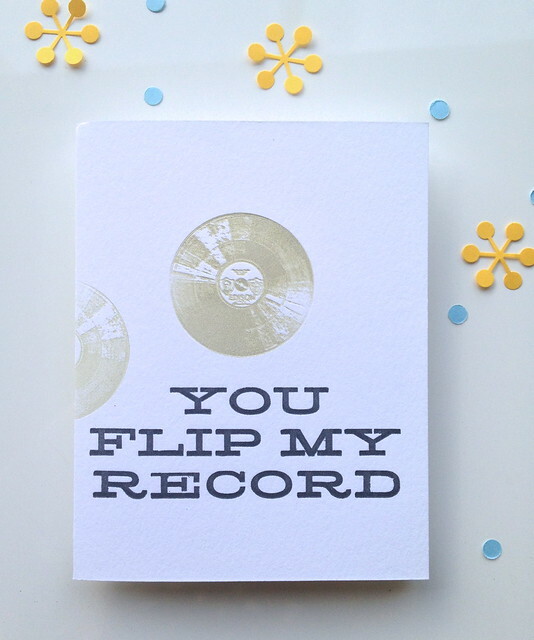 There are no shortcuts in letterpress, really. To me, getting to work with a wide variety of talented and passionate people is the second best part of freelancing. I'm really fortunate in my graphic design practice to work primarily with non-profit organizations that share my passions and interests, and in my letterpress work I tend to work with other creative types. Even when I'm printing someone else's design, it's a beautiful coming together of process and product. I also really love collaborating on personal projects, especially with artists that have strengths where I am weak. I made a beautiful set of cards with the artist Lisa Luck of Hello Lisa!, and got to work with artist/man about town Andy Sturdevant on an infographic for Common Roots Cafe. Both involved hand-lettering and illustration, and it was so much fun to incorporate those things into my designs when they are normally not in my wheelhouse. Do you have any favorite resources, books, blogs, sources for inspiration? Too many! Present & Correct is a London-based stationery shop, but they curate a fantastic collection of vintage packaging and ephemera (much of it letterpress-printed). I have always been very inspired by maps, and I love exploring the David Rumsey Map Collection, which has a fantastic digitized archive. 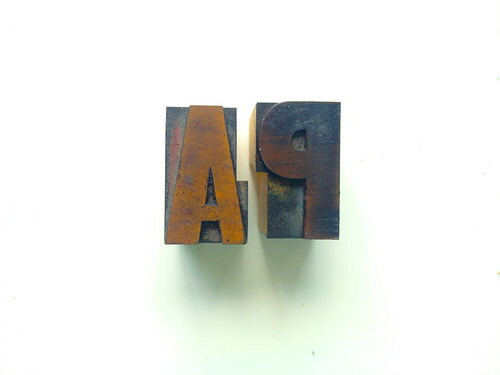 For excellent wood type references, I go to either the Rob Roy Kelley Collection at the University of Texas, which has uploaded and identified many specimens of wood type, or David Wolske's Letterpress Daily blog. What is your dream project? Something you have always wanted to make/do? If they would let me hang out at Hatch Show Print, that would be my dream. I could clean type, sweep the floors – whatever! They are a huge source of inspiration for me and I would love to be around that shop and absorb things by osmosis. What is the best piece of advice you ever received and why? I don't know if he would even remember telling me this, but my former boss Jeff Blodgett once told me, "Don't let the perfect be the enemy of the good." Sometimes I feel that this philosophy flies in the face of the typical M.O. for printers and artists, but if I was striving for perfection, I'd never be doing what I am doing now. I believe in getting things done and moving forward, while being true to yourself. Who are you inspired by? Other artists, musicians, teachers, etc. The list is very long. There is a select group of hugely talented letterpress printers working today, and thanks to the power of social media I get to see their work and process pop up on my phone every day. Besides my Instagram feed, one inspiration is the photographer Vivian Maier. She was an amateur street photographer whose work was never discovered or shown until a collector bought a box of undeveloped negatives from an auction house after Maier stopped paying for her storage locker, just 2 years before her death. The images are arresting, with a powerful energy, but she took them for herself and never saw most of them. There is something I like about that. I also am very inspired by sign painters, folk artists, craft beer brewers and pretty much anyone that makes things by hand in an impractically slow way in small quantities.